Cover a small cookie sheet with two layers of paper towels. Scoop the pumpkin on top and spread and let it sit while you make the dough; this dries out the puree. Place the water, oil, sugar, vanilla and salt into a small saucepan over medium heat. Stir to dissolve the sugar. Bring to a rolling boil. Reduce heat to low and add the flour. Use a wooden spoon to mix the dough over the heat until the flour is completely mixed in and the dough comes together into a ball, about 30 seconds. Remove from heat and scoop this mixture into a medium bowl or the bowl of a stand mixer. If mixing by hand, press the dough against the sides of the bowl to help cool the dough and let cool two minutes. Add one egg, mixing well by hand or with the paddle attachment of the mixer. You will need to mix vigorously to incorporate the eggs. The dough will clump up each time but after more stirring it will come together. Repeat with remaining eggs, one at a time, mixing well after each addition. Scrape the pumpkin puree off the paper towels and into the dough and mix well. Place the dough into a pastry bag fitted with a large star tip or a round tip with points, with about a 1/3-inch opening; I use Atero #864. In a shallow bowl, combine the sugar, cinnamon, and nutmeg. Set aside. Heat 1½ inches of oil in a medium saucepan over medium-high heat, until the temperature holds between 365 and 370°F. Place a wire rack over an aluminum foil-covered baking sheet. Hold the pastry bag over the oil, reaching a little into the saucepan. With the pastry bag in one hand and a knife or kitchen scissors in the other hand, quickly squeeze out six 3 to 4-inch long strips and then use the knife or scissors to cut off the dough and let the dough drop into the hot oil. Cook no more than six at a time. After one minute, separate any churros that are stuck together. Cook for four to five minutes total time, trying to turn them over after two minutes, and then fry until golden. 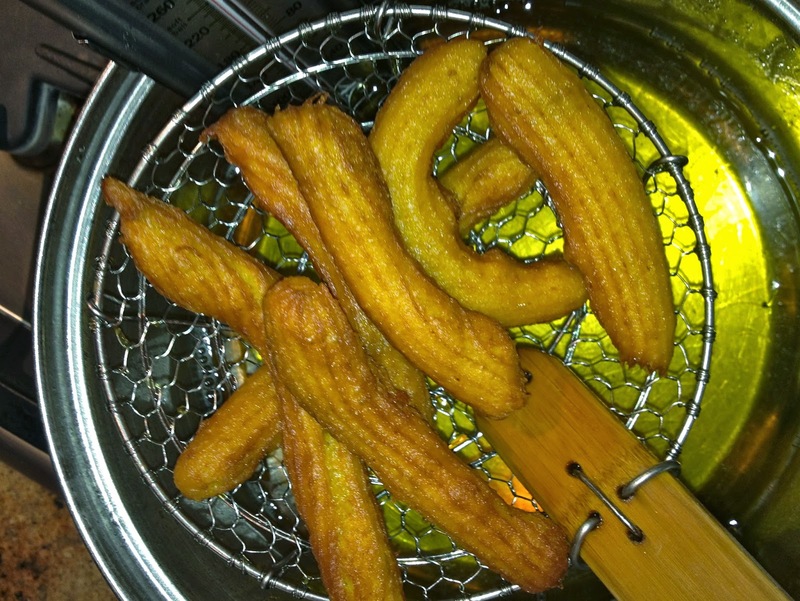 Use a slotted spoon to lift the churros onto the rack to cool slightly for a minute, or until you can handle them. Roll in the cinnamon and nutmeg sugar and serve. 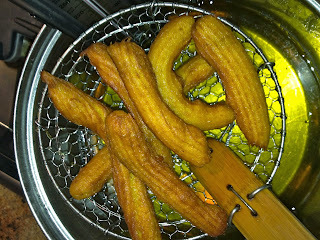 Do not wait until the churros are completely cool to roll in the coating; the residual oil helps the sugar mixture stick better. Store covered at room temperature for up to two days or freeze for up to three months. Reheat to serve.